Willkommen zu einer neuen Wochenchallenge. Heute mal wieder mit einem Kartensketch. Ich liebe Layoutvorgaben, denn das ist immer schon die halbe Miete. Man brauch dann nur noch ein Thema, Farben und die Lieblingsstempel/Stanzen – der Rest geht dann von ganz alleine. Welcome to a new Weekly challenge. This time it’s a card sketch again. I love it to follow given layouts because half of the stuff is already done then. You only need to find a topic, choose colors and your stamps and/or cutting dies/punchers – everything else comes in handy. 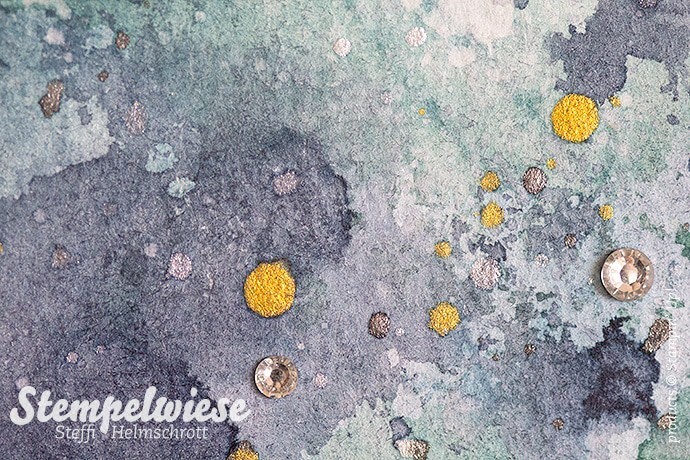 Der Hintergrund ist wieder mit Stempelkissen und Wasser entstanden und mit dem Spruch musste ich etwas tricksen, da ich das ohne sonst etwas zu nackt fand. Ich habe hier mit Smooch Spritz noch ein paar Glanzpunkte gesetzt. Ihr könnt auch den Glitzerkleber super dafür verwenden. I’ve set some highlights with the Smooch Spritz. You could also use the glitter adhesive Dazzling Details for that. Der Text ist aus dem Set Weiße Weihnacht und den kann man so biegen, so das man den Spruch der Kurve anpassen kann. Dadurch das es ein Klarsichtset ist, kann man wunderbar sehen wo man stempelt. Die Kordel habe ich mit Crystal Effects festgeklebt. 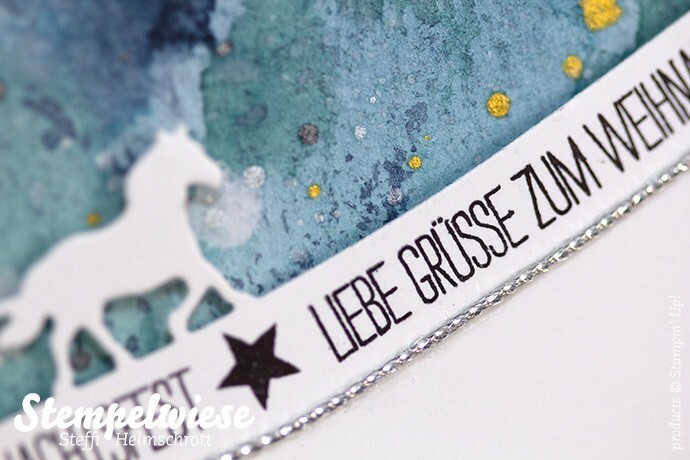 The text is from the White Christmas stamp set and as it isn’t that high/wide you can easily bend it to match the curve. As it is a clear stamp you have a clear view of what you’re stamping. I’ve fixed the cord with the Crystal Effects glue. So, das war wieder meine Idee dazu und nun seid ihr wieder gefragt. Bastelt eine Karte mit dem Layout wie oben angegeben und zeigt sie uns. Geht dazu auf unseren Design Team Blog» und fügt euer Werk mit ein. Du musst nicht zwangsläufig einen Blog haben, es reicht auch wenn du es nur auf Pinterest oder Instagram hast. Ich freue mich auf eure Ideen! So that it is again with my idea to this weeks theme and it’s your turn again now. Make your own card based on the given layout and show it to the world. Be sure to visit our blog and add your creation to our List. You don’t need to have your own Blog, it’s totally fine if you just pin it to Pinterest or post it on Instagram. I’m sooo lookin‘ forward to seeing your ideas. Your interpretation of the sketch is perfect Steffi. I adore the background made all the more beautiful by the splashes of gold and silver – just stunning! Love your card and thanks for the great background idea…so pretty. deine Kare ist mal wieder ein Träumchen !!! Der Hintergrund ist klasse. Wie hast du den gemacht und welches Papier hast du dafür verwendet? So love this card. It is so amazing and the technique is incredable and gives the card life. Such a clever little cookie you are. Boah, der HG sieht ja phantastisch aus. Eine dezente, aber unheimlich schöne Karte! Deine Karte ist soo schön. erinnert einen an einen kristallklare Sternennacht. ja, hat was magisches ❤︎ Danke für dein Feedback! You always have me saying WOW o WOW. I just adore everything you create. Steffi, this card absolutely blows me away. The background is amazing. You are so incredibly talented! Once again I had to pop my eyes back into my head! This card is so beautiful with the splatter background. I would love to try and recreate it myself. Stunning Steffi! WOW! The gold and silver splatter takes an already beautiful card to the next level! Thanks for the inspiration! 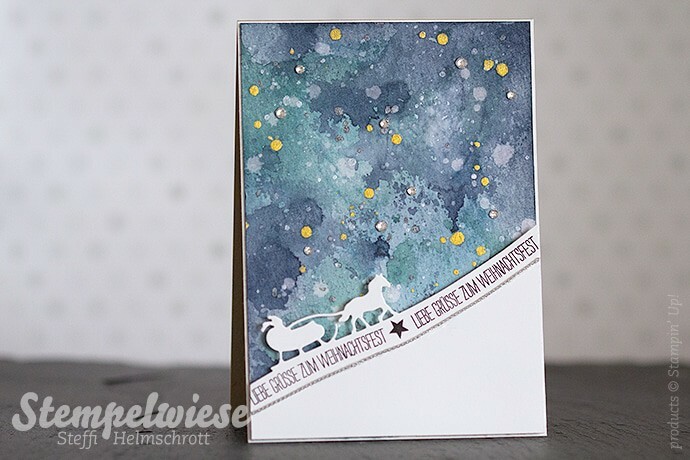 Steffi – your card is absolutely brilliant! I love the gorgeous texture you’ve created in the background. 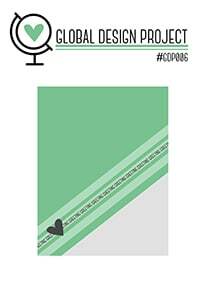 I’m so honored to be on the Global Design Project team with you. Steffi, your artistry amazes me. I love the background you have painted and it looks lovely against the white silhouette. So happy to be part of the Global Design Project team with you. You are inspiring. What a stunning card Steffi! Amazing background. Hi steffi. When u said u created this card using an ink pad and water again what exactly did u mean? I would love to know this technique. It is a stunning work of art.